What Happened to Bob Ross' Paintings? If that’s true, Ross probably donated around 1,200 paintings. 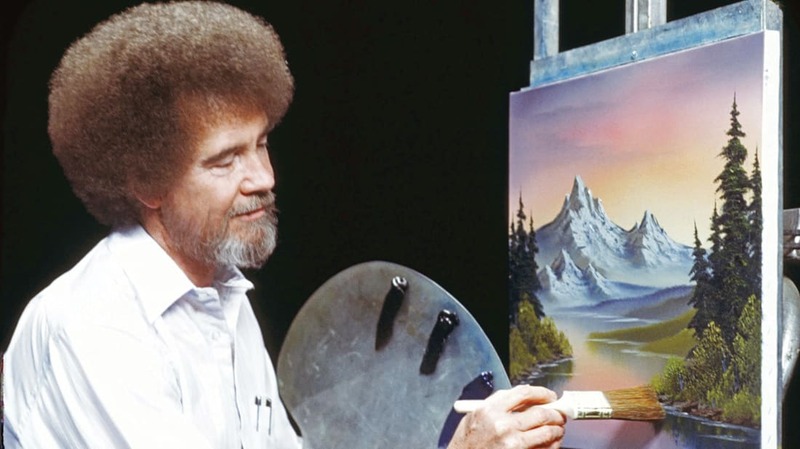 Ross shot 403 episodes of Joy of Painting and made three copies of each painting per episode. The first copy always hid off screen, and Ross referred to it while the cameras rolled (none of his on-air paintings were spontaneous). Ross painted a third copy when filming finished. This time, an assistant would stand behind him and snap photos of each brushstroke. These pictures went into Ross’ “How to” books. As for the 28,800 paintings Ross made outside of television? We have only a vague idea. Some Ross actually sold. Before becoming a TV star, Ross was an Air Force Master-Sergeant in Alaska. There, he painted and sold gold pans. Later on, Ross taught lessons year-round, and he regularly gave free paintings to his students. Sometimes Ross kept his paintings, eventually donating them to charity. A couple of his pieces even found their way onto the black market: during Joy of Painting’s second season, a burglar stole 13 reference paintings from Ross’ van. Do you own a Ross original? How’d you get your hands on it?